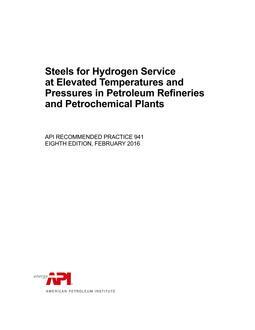 This recommended practice (RP) summarizes the results of experimental tests and actual data acquired from operating plants to establish practical operating limits for carbon and low alloy steels in hydrogen service at elevated temperatures and pressures. The effects on the resistance of steels to hydrogen at elevated temperature and pressure that result from high stress, heat treatment, chemical composition, and cladding are discussed. This RP does not address the resistance of steels to hydrogen at lower temperatures [below about 400 °F (204 °C)], where atomic hydrogen enters the steel as a result of an electrochemical mechanism. This RP applies to equipment in refineries, petrochemical facilities, and chemical facilities in which hydrogen or hydrogen-containing fluids are processed at elevated temperature and pressure. The guidelines in this RP can also be applied to hydrogenation plants such as those that manufacture ammonia, methanol, edible oils, and higher alcohols. The steels discussed in this RP resist high temperature hydrogen attack (HTHA) when operated within the guidelines given. However, they may not be resistant to other corrosives present in a process stream or to other metallurgical damage mechanisms that can occur in the operating HTHA range. This RP also does not address the issues surrounding possible damage from rapid cooling of the metal after it has been in high temperature, high pressure hydrogen service (e.g. possible need for outgassing hydroprocessing reactors). This RP discusses in detail only the resistance of steels to HTHA. Presented in this document are curves that indicate the operating limits of temperature and hydrogen partial pressure for satisfactory resistance of carbon steel and Cr-Mo steels to HTHA in elevated temperature hydrogen service. In addition, it includes a summary of inspection methods to evaluate equipment for the existence of HTHA.